Denver University junior Makayla Cappel of Hailey has earned All-American honors for her eighth-place finish in the NCAA Nordic Ski Championship 15-kilometer mass start classic race March 9 at Bohart Ranch in Bozeman, Mont. Cappel, 20, was clocked in 54:37 over the 9.3-mile course and finished 65 seconds behind women's gold medalist Amy Glen of the University of Vermont (53:32). There were 39 women in the field. 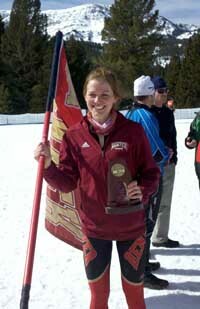 Ninth place went to another Sun Valley Ski Education Foundation alumni, Annie Pokorny of Middlebury College in 54:45. There were only 13 women who achieved All-American status in the Nordic events during the 59th annual NCAA Ski Championships hosted by Montana State University March 7-10. Cappel and Pokorny were two of them. Cappel earned 58 points out of the 113 Nordic points gained by the Denver Pioneers women at Bohart. In the other Nordic event, the 5k freestyle race March 7, Cappel (15:25) finished 15th of 39 racers in a race won by the University of Utah's Maria Graefnings (14:05). Pokorny was 25th in 15:50. All-American honors go to the top 10 racers. The University of Vermont Catamounts won their first NCAA combined Nordic and alpine title since 1994, and sixth overall, with a meet-record 832 points. Denver was sixth of 21 schools with 505.5 points. Cappel, a 2009 Wood River High School graduate, is majoring in marketing and Multi-Media Web Design at Denver. A daughter of Greg Cappel of Hailey and Sharon Egan of Santa Barbara, Ca., Makayla was a key defensive player for coach Greg Gvozdas' 2008 Wood River girls' soccer team that went 18-2-1 and won the State 4A consolation title. She was a Junior National cross-country ski qualifier for the SVSEF under coach Rick Kapala.